Looking for the best in Columbus, Ohio home theatre furniture? If so, then look no further than the Amish Originals Furniture Co. showroom for all of your home furnishing needs. You truly have to see the selections we have available in person to truly understand just how stunning and attractive they are. Not to mention, the quality of hand craftsmanship is truly unbeatable. So what exactly do we have to offer here at Amish Originals Furniture Co.? 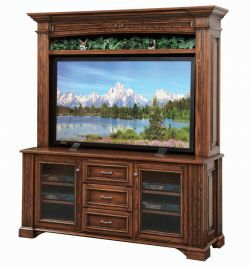 We actually offer a large variety of selections, making us the number one choice for Columbus, Ohio, furniture, but that also means we have paid special attention to detail when it comes to offering a wide selection of home theatre pieces. All of these items are available from our selections in the Media and Entertainment section. After just one visit to our showroom, you will quickly come to understand why we’re the number one choice for Columbus, Ohio, home theatre furniture. For over 20 years now we have been servicing customers from in and around Northern Ohio, as well as visitors from all over the globe. We’ve spent over two decades making quite a name for ourselves. The pieces are made to order. You are able to choose your pieces, your style, your American hardwood, and even the finish to ensure that the pieces match your taste. You’ll find a truly amazing variety of choices when you visit our showroom. We have furniture to take care of every room in your house, including the great outdoors. We are the fairest in competitive pricing. We manage to keep our costs competitive even against furniture of lesser grade quality and craftsmanship. The great news is that you can keep the items you choose from us for decades to come, if not more, unlike selections you may find at other types of furniture stores. The best in customer service. We realize it can feel overwhelming when you furniture shop, whether it’s for one item or for an entire house. Our friendly, expert staff is ready to help you make important decisions about the pieces for your home. Whether you are seeking the best in Columbus, Ohio, home theatre furniture or any other room of the home, let Amish Originals Furniture Co. take care of you.